The Nokia Asha 302 has a 3MP fixed-focus camera that produces photos with maximum resolution of 2048 x 1536. The camera interface has been updated so it's a lot more like Symbian. On the screen you get a column on the bottom with the virtual shutter key in the center and the options and back keys besides it. A left or right click on the D-pad on the screen reveals two shortcuts for video camera mode and gallery. Up and down on the D-pad control the digital zoom (but we'd advise against using it). Going into the Options menu, you get controls for effects (greyscale, sepia, negative), fun frames (Polaroid photo, a Wanted poster, etc. ), white balance, exposure, a viewfinder grid and extended settings. There's live preview of effects and frames, which helps you choose the best one for the given situation. You can't expect much from the Asha 302 camera - it will do if you really have nothing else to snap a photo with. Levels of fine detail and noise are decent, but colors are not terribly accurate. There also seems to be a lot of fringing going on. Here are the results themselves. The Nokia Asha 302 has a 3MP camera and qualifies to enter our photo quality comparison database. The synthetic resolution chart shows the camera is not the best, even in the 3MP category along with heavy fringing. The yellowish fringing is present in the second chart, which also shows that colors in photos are accurate though a little dull. Under artificial lighting (the third chart) we can see a blueish tint in the whites. The Nokia Asha 302 is also capable of VGA@15fps and QVGA@30fps video capture. The interface of the camcorder is the same as the camera. Options include setting the video length from MMS to maximum available. You can also use effects or record videos without sound. Video is a traeoff between resolution and framerate. VGA videos have good detail (though there are visible compression artifacts) but they are quite choppy, while QVGA videos are smooth, but the low-res frames are compressed way too much. So, VGA@15fps is the way to go, you'll just have to swallow the choppiness. Here is a video sample (VGA@15fps) for you to check out. The Nokia Asha 302 has excellent connectivity that reaches beyond its price point - quad-band 2G/GPRS/EDGE along with penta-band 3G enable it to work on any GSM network. The 3G is fast too - 14.4Mbps downlink and 5.76Mbps uplink - though the only way to really appreciate all that speed is if you're using the 302 as a data modem for your computer. The way to do that is through the microUSB port. It's also used for charging, mass storage and USB On-The-Go. We tried out several card readers and a good deal of them worked (but then some didn't). The Asha 302 has Wi-Fi b/g/n connectivity, which means that it will work even with new routers without issues. We've gotten used to Wi-Fi Hotspot functionality from smartphones, but the Asha doesn't do that. There's Bluetooth 2.1 with A2DP available too for stereo Bluetooth headset connectivity and local data transfers. And finally, there's the standard 3.5mm audio jack, which allows you to use your own headphones. The browser found on the Asha 302 is the Nokia Browser, which uses server-side compression to keep those data charges in check. Another plus of the compression method is faster page loading times. The start page is easy to navigate with a unified URL field and search field at the top and shortcuts at the bottom for Social network, entertainment, news and more. There's a History and a Favorites tab available too. There's also a data counter on board to keep track of how much you've used out of your monthly data plan. Pages are rendered okay but some mobile sites turn out too zoomed in and users can only view a single article at a time. There are no advanced features such as the tabs and syncing offered in Opera Mini. The calendar application, like on every S40 Nokia phone out there, is pretty good. You can set reminders, meetings, calls, birthdays and more. The landscape layout offers a dual-screen viewing solution so you see the appointments you have without leaving the month view. Though Nokia isn't one to leave the customer without all the required organizing apps you will be able to find some in the Nokia Store as well. 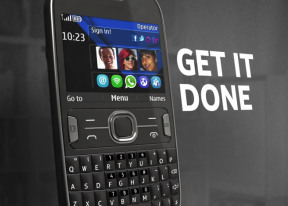 The Nokia Store is the place to download free and paid apps and games for your Nokia Asha 302. The interface is easy to navigate and each app comes with a description, screenshots and user reviews to help you decide. The notes and to-do apps are self-explanatory. There is a stopwatch and a countdown timer too. The calculator app uses the familiar D-pad and soft buttons layout to access the basic operations. The Asha 302 also comes with a voice recorder with no time limit and an alarm clock. The alarm clock still doesn't offer an option to set multiple alarms.